Regina – The Regina Pats fell 3-0 at the Brandt Centre on Wednesday night at the hands of the Kamloops Blazers. Kamloops opened the scoring just 17 seconds in when Garrett Pilon rifled home his 17th of the year. Five minutes later, Luc Smith scored on the powerplay and it was 2-0 Blazers after the opening period. In the second, Nolan Kneen put home a rebound for his third of the season and the Pats found themselves down 3-0 heading to the third. Max Paddock would stop all 18 shots he faced in the final frame as part of a 38 save performance, but Regina could not solve Dylan Ferguson who turned aside 42 pucks for the shutout in the Kamloops net. The Pats outshot the Blazers 42-41, the powerplay was 0/6 and the penalty kill went 5/6. The Pats (16-15-2) are back in action on Friday against the Saskatoon Blades. Puck drops at 7 p.m. at the Brandt Centre. Tickets are available at reginapats.com, the Brandt Centre Box office and at all Regina Safeway locations, Safeway Funzone tickets are just $13 plus tax. Well it was a great game for Paddock to see what his awful trades and inaction have got him. Without steel and I'll exclude Henry from this comment you have a team of 10.5 forwards that are essentially the exact same player. 3rd line grinder types that will score the occasional goal. I still blame Paddock for ruining last year's team and being blind to what team he needed to put on the ice this season. What can be done? Honestly I don't think anything, nobody is going to want any of these guys as trade bait. Pats fans have reminded the rest of us ad nauseam this year about how their team is in the Memorial Cup no matter what. Instead of being envious or even indignant (at a rather ridiculous tournament format) maybe fans of other teams should instead consider feeling sympathy for Pats fans. After all, come May they have to watch their team play the best teams in the country - no matter what. On the bright side, if the Pats season continues on its current trajectory they at least don't have to worry about embarrassing themselves in the first round like the Blades did in 2012. And speaking of the Blades, Regina had better hope their team shows up against Saskatoon this weekend or they could be on the outside looking in sooner rather than later. Of course, a good weekend for Saskatoon isn't likely to bring on any tears in Moose Jaw or Swift Current. Andrew you may be eating you re words, this is sports after all. JP - time is now to make some IMPACT trades. The trades done this year have done nothing to make us a better team. I agree it seems there are not obvious big names for trade bait. The only teams that would trade for 20s are the contenders and the pats are contenders. Is it possible that paddock is showcasing some younger players so that their trade value is increased? Could that be a partial reason for their poor record? These comments are really funny. Junior hockey can be so difficult. The Pats were two wins from a WHL championship last year and fans strictly living in the present would have traded that away for a chance this year. GM's don't get to live that way. Truth be told, the Pats were handcuffed last year by getting Brooks back. They had no choice but to go after it as they were that good. They go to game six of final with Brooks, Wagner and Henry all playing through significant injuries, and never having Lesychyn available. Believe what you want but it is fact that they tried to get a goalie last year but none of significance were available. And until two weeks ago they believed they would get Wagner back and are still holding out hope that Colorado has a change of plans for Jost. Unfortunately, that's the way it goes. OMG this is what? The 10th time this first half that Paddock has come out and said after the game that his team didn't work, or match the other teams energy, blah blah blah blah. Yet he hasn't done one tangible thing about. All talk…no action. Maybe three times anybody went to the net - no guts or character. Where did Smith score from…... You got it. Nobody wants to pay the price or consistently go to the dirty areas. Paddock wants to play run and gun but has no talent to play in. No runners-no gunners. Instead a whole bunch of mediocre or below type players. Sidaway and Mahovlich are our big acquisitions? We bring in Tier 2 players to bolster our lineup? It's a sad looking bunch out here. Paddock can say it's not the talent but who is he kidding. This is his mess and he has to own it. Don Hay, unlike Paddock, demands attention to detail and hard work. With exception of a few he wouldn't have any of the of the players we got going to the Memorial Cup. Since he's been here Paddock has only had one season where he's got to .600 and that was last year thanks to Toronto and Brooks return. Every other season has been in the .500s. His teams are not hard working, always near the top of the league in penalties, lack toughness, and seldom play with any emotion, players sniping at one another, bad trades one after the other. The assistant coaches look lost and nobody appears to be working with the d-men. I think this is case where we've been BS'd more than little. As they say BS baffles brains. Fans at the rink last night were disgusted and have every right to be. Ticket prices have doubled in some cases, less in the season ticket packet, now expensive playoff packs, Memorial Cup tickets, outdoor games at over $300 for the game, $250 concert tickets etc etc. All sorts of expensive fluff yet they can't put a team on the ice fans can be proud of. It's a knowledgable fan base in Regina and they know when they're being sold a bill of goods. Buziak is a complete idiot. He thinks he is a fighter and look what happened to him with two minutes left. Did he not learn from Paddocks comments 2 minutes left in a game fighting is usless.After getting pounded maybe he got the message. If it was not for our outstanding goal tender what would of the score been? This team is going to self distruct very soon at the cost of complete lack of effort. If this is our team for the future we are in big trouble. There is no pride with some players to where that Pats jersey. Mr Paddock I think your in big trouble. Andrew - can you clarify what you mean by "the ridiculous tournament format" you refer to? And BTW thanks for putting a name to your comments, at least your comments can be taken seriously as a true Junior hockey fan. We knew with Steel and Mahura gone for awhile the Pats were going to have trouble scoring (had trouble with consistency with them in the line-up) and that showed last night, although they did have a lot of shots and certainly should have had a goal or two. Nonetheless Ferguson played well and deserved Star status. I was impressed with the PP puck possession and although they did not score it will come if they maintain that style. I'm here Mr. Weppler just waiting for your usual comments about the Memorial Cup Champs who didn't show up again last night. AT ALL THAT IS. Who really cares about peoples names on here other than you ? What does it matter ? Who knows if you are using your right name and who cares other than you ? Pats are in trouble and you know it, and as usual the Better teams start to bear down more after the Christmas break so it will not get any easier for the Pats or any other team trying to get to the Playoffs. Regina had their year last year when they had such great talent as they did and the timing backfired because they are basically a No Show this year. Brandon, Moose Jaw and Swift current have much better teams than last year and the standings are showing it. So Mr. Weppler , I say to you:: Have A Very Merry Christmas & A Happy New Year. Keep up your great cheering habits for the Pats because it doesn't really matter if you cheer for a Winner or a LOSER. anyone who posts to this message board as Anonymous cannot be taken seriously. they are too scared to be challenged for there comments. yes the pats are not the team they were last year missing a few key components (not exactly just players) Grit on the blue line, shot from the blue line and goal scoring. lets not forget with big boys like Hobbs and Harrison and Sergei in front of brown or anyone for that matter puck didn't cross center all that often. communication and consistency on the ice is a problem but lets face it in WHL you can almost have a different team every year hence this years pats team. not an excuse but seems like they are taking longer to gel then in past years. Funniest will be if the pats run the table in the second half of the year with the players we have all the Anonymous comments will be calling for JP contract extension. Regina is a fickle town as ive said before SK roughriders were 5-13 last year people were running jones out of town with a forks this year flipped the script and he is a god among men and the key to a Grey cup. realize its sports people and from year to year everything is different See NHL standing! Compared to the previous decades the Pats are definitely a relevant team in Regina. You seem more people wearing the gear and going to games then at anytime in the last 30 years. It's so hard to watch this team after witnessing the 52 win season last year! I still keep holding on to faith that Paddock will make the right moves and pray the team will gel. I totally agree with the comment "Without steel and I'll exclude Henry from this comment you have a team of 10.5 forwards that are essentially the exact same player. 3rd line grinder types that will score the occasional goal." I hope some moves are made quick or it will be a LONG 2 months for those boys (end of regular season to Memorial Cup)!! The problem is and always remains with the manager in Jr hockey. Good ones like Mike Johnston are not rivalled by many other GM's. You build, plan continuously during a season and evolve on the fly. One poster whines about not getting Wagner back etc etc. and just finding out. You should never bank on something that you have no control of. Now the Pats are behind in trades and behind the 8 ball. By standing still and hoping for a favour, they are now scrambling to play catch-up. Last night unfortunately was nothing new. It's happened repeatedly over the season already. Same issues and problems but still no reaction or solutions. The talent isn't good enough and hasn't been since the season started. They have occasionally played good for a couple of games but it never lasts. Watching these last few games won't change what already is a big problem. To point out poor performance and there has been lots of that doesn't make anyone group of people i.e. Regina ports fans "fickled". The problem are those who for whatever reason can't seem to accept the fact that there are big concerns. You can bet the CHL has big concerns. To voice displeasure is not being fickled at all. Most often those people are shown to be correct. The best the Pats can hope to do is use whatever resources they have at their disposal to make as many key trades as they can. Upgrade in goal, add two or three strong d-men and add a few complimentary forwards. Yes the price will be high. When will an opportunity like this ever present itself again? Let the following years play out as they will. Other teams who have done the same thing didn't fall into the abyss because of trades but rather bad management. Next season moving a couple top players will recoup first round picks and more. The GM did it the first year he was here so I'm sure it will done again. Just get busy and fix this hot mess. I for one will not cry over lost assets for an event like this. Time to stop defending the indefensible. The hard facts are this - the atmosphere is awful at the Brandt Centre. A random bantam game at the Mahon Arena rivals in intensity. The 20 year old situation is comical. The 20 year old goalie is riding the pine. Slobosian hardly touches the puck and easily gets knocked off the puck. Less Sam Steel - there is no real offensive threat at forward. There is no secondary scoring and players like Lesychyn and Henry are laying eggs. This team will be lucky to make the playoffs. Let's look at this from a different lens. The Pats have major holes, there's no questioning and those issues are only substantiated with the (brief) departures of Steel and Mahura to the WJHC. Here's my solution to this complicated puzzle. On the first line, what worked so well for Steel a year ago, it was the size and puck retrieval of Dawson Leedahl to allow Sam to showcase his creativity. Robbie Holmes hasn't been able to fulfill that role and I know injuries are part of the picture, but Nick Henry has seemingly regressed. What I'd like to see Paddock attempt once Sam is returned is get a pure sniper Emil Oksansen on the right side and use Nick Henry as a trade asset to lure one of Tyler Benson or Kody McDonald to throw on the top line. Matt Bradley is a serviceable second line player. The discipline has been concerning at different points but nonetheless he can capably spearhead the second like. We saw someone from Kamloops last night who would be a tremendous fit alongside Matt, that being Garrett Pilon. If you can fit Pilon and Bradley on one line, I'm okay additionally upgrading Wyatt's twenty year old spot with the likes of Cam Hebig/Braylon Shmyr, personal preference is Shmyr. The third line has been virtually non-existent and Paddock desperately needs Leschshyn to find himself. The misnomer with Jake is that he's an offensive contributor, news flash...he's not. The paramount reason the Vegas Golden Knights took a leap of faith is due to the fact that he projects out as a penalty killer and defensive specialist, junior or professional. Tanner Sidaway has again shown no progress in the points department but a line of him with Jake and a cheap addition, a thorn in the side last year for Regina, Seattle's Nolan Volcan. The forth line truthfully as seen with many other Memorial Cup hosts is a non factor so I don't see the need to upgrade the bottom three. As much Brayden Buziak, Bryce Platt and Scott Mahovlich are enigmas offensively, they'll have to suffice because upgrades are needed all over the map. Defensively, Mahura is the ace of the back end and to extract the utmost effectiveness of both Josh and Cale Fleury, they'd be best served having the two on separate pairings. Liam Schioler would be a nice compliment for Josh as Mahura's a risk taker and Schioler is a stay at home who will offset the turnovers you'll see from time to time. I'm jumping ahead a bit here but it's evident exhausting a twenty year old spot for Tyler Brown is counter productive. I mentioned the possible addition of Kody McDonald earlier, in the same transaction I'd like to see Regina target nineteen year old Tavin Grant which opens up the ability to add an overage on the back end. Turner Ottenbreit was a controversial figure during last year's final but he's a imposing figure who has underrated offensive touch. Could Regina warm up to him? I don't know but if they could he's just what the doctor ordered. Volcan and Ottenbreit could be in the same trade and while I pen this, John Paddock conceivably could part ways with Zamula at Christmas while creating a larger scale deal with Seattle packaging in Sami Moilanen as well. Dawson Davidson hasn't had a great year but his spot isn't in peril. Flanking Davidson on the third pairing is someone who hasn't garnered much respect, and that's Marco Creta. In fact, Marco stands a great chance of hearing his name called in the 2018 National Hockey League draft and his reliability has evolved throughout. Sami Moilanen,Turner Ottenbreit and Nolan Volcan for Logan Nijhoff, two second round picks and Tyler Brown. Braylon Shmyr for Wyatt Sloboshan and Owen Williams. Kody McDonald and Tavin Grant for Nick Henry, Robbie Holmes, a 1st and a fourth. PATS are a heaping pile of Cr a p right now. 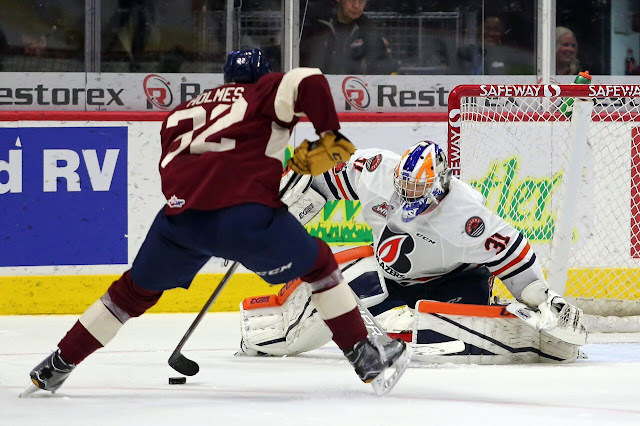 Without the heroics of Max Paddock in goal, Kamloops would have won 10-0 Wednesday night at the Brandt Centre. I'm also a first and LAST year Pats season ticket holder. I will give the Riders my money from now on and all my Christmas presents will be from the Rider store. Disgusting effort pats. To the anonymous poster who cautioned me that I may have to 'eat my words' one of these days: what exactly am I in danger of having to eat? I didn't make any predictions about how the Pats might do in the playoffs or Memorial Cup; rather, I said that whether they are good or bad you have to watch them come May. Based on their current state of affairs it might not be a very enjoyable experience for you, so you and a lot of other anonymous posters might want to reconsider whether being the host team is a blessing or a curse. At least for me, if I am still watching my team come May I know that I will be watching a competitive team because they will have EARNED their spot in the dance; whereas you really have no idea - the Pats might be good or they might be terrible. Mr Weppler, the Memorial Cup format is ridiculous because far more often than not the host team is undeserving of their spot in the tournament and at an unfair advantage over the teams that have actually earned their spots. First, the reason that the Stanley Cup and the Memorial Cup are such great trophies is because they are difficult to win. The very real possibility (e.g. last year) that a team could lose in the first round, parachute into the championship tournament, and get hot for a couple of games to upset teams that have battled for a month and a half undermines the value of the trophy. The likely reason the league uses this format is because they think it will lead to greater revenue and a greater atmosphere; however, there are a couple of reasons why this may not be true. First, a large part of the economic spin off from the Memorial Cup is from out of town fans buying hotel rooms, gas, and food - this would also be the case if the league instead gave the spot to the host league runner up. Second, atmosphere is contingent upon the games being competitive and there is a greater chance that you will have competitive games if the runner up from the host league final participates. Finally, I would be curious to know what other sports leagues outside of junior hockey even use this format - pro leagues certainly don't and to my knowledge the same holds for CIS, NCAA, and other amateur events. 1. Goaltenders: are you really comfortable hitching your wagon to a 19 year old goaltender with a total of 36 games WHL experience (no playoff games) and a 17 year old rookie who only has 19 games under his belt? I know most of the posters seem to think that anything is better than Brown, but - yikes! 2. What makes you think that Seattle would even give you Ottenbreit for two 2nd round picks and Nijhoff? Given your obvious opinion of Brown, he can't add much to the trade and Seattle wouldn't want him anyway because they already have a 17 year old who backstopped them to a league championship last year. 3. Wouldn't it be more likely that Saskatoon is more interested in taking the Pat's playoff spot this weekend rather than giving away one of their best forwards for a former 9th round bantam draft who has yet to do anything at the junior level and a 20 year old who also hasn't done anything this year according to participants on this blog? Joey BiShop, Mr Weppler isn't the only one on this blog who finds the 'anonymous' tag annoying, and it doesn't have anything to do with whether the poster is using his real name or not. When an anonymous poster makes a comment that I or anyone else wants to respond to I have to say 'hey anonymous poster who said [insert summary of his or her statement]. Its a heck of a lot easier to just say 'hey Mr Weppler' or 'hey Joey BiShop'. Also, there is zero accountability to using the anonymous tag. So, for example, take our resident Tyler Brown critic from a couple of weeks ago who thinks that Brown isn't even good enough to play in the WHL. If the Pats season turns around in the new year and Brown happens to win the goaltender of the week award our critic could easily change his tune and suddenly call Brown one of the best goalies in the league. I think that the fact that he is too much of a coward to sign his name to his scathing critique of Brown shows that deep down he doesn't even believe what he himself is saying. He is probably worried that he might be wrong and is scared Mr Weppler will call him out on it sometime in the future. Andrew W - we will have to agree to disagree on the Memorial Cup format. Without the Host Team being given an automatic into the Tournament there would be no "buzz" for that hosting committee. Not knowing who the 4 Teams will be until shortly before the Tournament starts it would be very hard to pre-sell tickets. Knowing the Host Team will be there does a whole lot for these ticket sales. If the Tournament was hosted by Portland (e.g.) and it ends up that Wheat Kings and Prince George are the WHL Teams that make it, can you imagine anyone in Portland getting exited and wanting to volunteer? And actually how many fans from both of those Teams would make the trek to Portland? I doubt many but a few real die-hards. I think we can agree that the CHL is out to 1) make some money and 2) ensure that the Host City can stage an A1 event. Without the Host Team being there I believe both of the CHL's objectives would not be met. I agree with you when you say that the CHL gives the host team an automatic bye because the league believes that the current format provides the greatest chance of staging a profitable event. However, if you agree with the above statement then you also have to acknowledge that most years (including this one unless things drastically turn around) the host team doesn't deserve to play in the event. Winning the Memorial cup the way Windsor did last year is kind of comparable to buying a video game, finding a cheat code online that takes you directly to a weakened boss, and then 'beating' the game. Doesn't that kind diminish the significance of winning the Cup? By the way, how is the 'buzz' factor working out for Regina right now? Like I said Andrew we will have to agree to disagree on some things. Buzz in Regina/Saskatchewan - I think there has been and still is a lot of buzz. As you are aware the Host organizing committee plans on putting on a top notch showcase the week of the Memorial Cup with the Concert; Outdoor games; retired WHL players hanging around that week, etc. It started with Pats fans scampering for season tickets for this season and believe we hit an all-time high of 5,000. That automatically gets the building close to capacity (and generally more excitement in the building) every home game, and more than ever I have noticed (as a long time season ticket holder) there is a wider age group attending the games now as compared to the Parker years. IMO more children, teens and young adults even though there was a ton of complaining when the new ticket prices were announced with new ownership a few years ago. If you truly enjoy Junior Hockey you have to take the good years with the bad years and true fans are not wagon-jumpers. Will there be a drop off in season ticket holders next year?...time will tell although there have been some on this blog saying they are DONE after this year. So be it...it's totally their choice...the Pats never made anyone purchase a ticket for any game. And although some bloggers say "they were promised a better team than last year"" because the Pats will be hosting the Cup, I have yet to have those Anon's provide a quote from anyone within the organization saying anything to that effect. No WHL organization can "guarantee" a better team from year to year...too many unknowns. Long after the wagon-jumpers are gone the Pats and the Regiment will be here providing entertainment to us Fans that go for the mere enjoyment, the game atmosphere, the relaxation, the socializing, the chance to see young boys mature to being young men putting everything they have into a sport they too love. After all isn't that what it is really all about? Yeah, I think there is a lot of stuff from your previous comment that I agree with. Oddly enough, I think there are also a lot of things that we would agree on when it comes to the Pats even though I am a Broncos fan. I still stand by my comments on the Memorial Cup format though, and on that note here is an interesting article for you to google if you have some extra time on your hands: "Four alternate formats for the Mastercard Memorial Cup" by Rory Boylen.